Do you know how to make gourmet cupcake recipes with chocolate? I hear of gourmet cupcakes all the time. Just what are they? 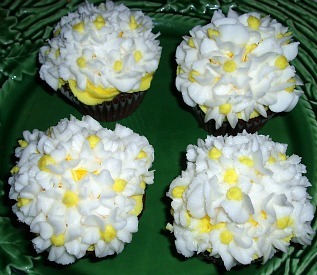 All my life I have made cupcakes because they are so simple and easy to make. I never thought of them as being GOURMET. People have told me that the ones they have tasted that were called GOURMET did not taste good. I am told that they are usually decorated with added junk candies making them rich but without flavor in the cupcake and chocolate should always be flavorful. After giving much thought to gourmet cupcakes, here is what I came up with. The first thing is that to be GOURMET, it must taste extra good especially chocolate cupcakes. Next to be GOURMET, it must be extra special or something different; not something you can pick up at the grocery store. Last, it must look yummy! Dark and luxuriously rich chocolate can also be used to produce a range of coatings and frostings as well as the cake batter for when you are learning how to make a gourmet cupcake recipe. It can simply be melted with cream or butter to make a thin satin glaze; these glazes can be whipped to aerate them into a frothy thickness. The chocolate can also be carefully cooked into a dense fudge frosting. Many types of chocolate can be interchanged; unsweetened, semi sweet or sweet but the sugar content will need to be adjusted if altering the type from the recipe. Because everyone loves chocolate I chose to make delicious chocolate cupcakes from a cake recipe. I love the taste of cream cheese so I made a cream cheese filling and added miniature chocolate chips. A delicious cream cheese frosting adds the final touch. 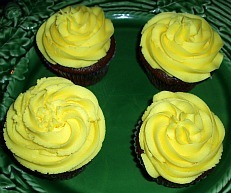 When using a cake recipe for cupcakes, after blending fill paper lined regular size tins with ¼ cup of batter and bake at 350F degrees until pick comes out clean (Generally it is 12 to 15 minutes). Cream together the cheese, sugar and egg. Fold in the chocolate chips. Cream together the cheese and butter. Gradually add the powdered sugar while beating. May need to add a very little milk to get spreading consistency. 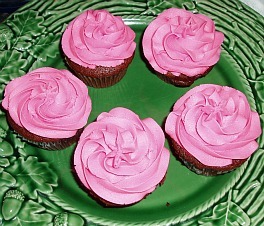 Learn how to make a gourmet cupcake recipe with this delicious Mahogany cake recipe. Boil milk and cocoa together until thick; cool. Cream butter and sugar; add eggs and vanilla beating well. Mix baking soda in buttermilk; add to creamed mixture alternating with flour. Blend in cooled chocolate mixture; fill cupcake tins and bake. This gourmet cupcake recipe can either be baked as regular size cupcakes or in a large muffin paper lined tin. Combine baking mix, ½ cup sugar, egg, milk and peanut butter; beat until blended. 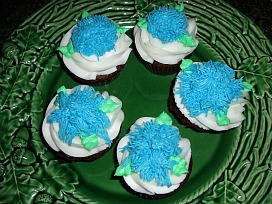 Fill regular size cupcake tins with ¼ cup batter; bake until pick comes out clean. Heat chocolate and butter over low heat until melted. Stir in powdered sugar, vanilla and hot water until desired consistency. Spread on top of each cupcake.